Taking in the sights in downtown Tulum. The lobby at Sanara Hotel. Biking from our hotel to the Mayan Ruins. Tackling the Mayan Ruin hike after our bike ride was totally worth it. Tulum’s beach is by far my favorite yet. Not one bad view at the Mayan Ruins. 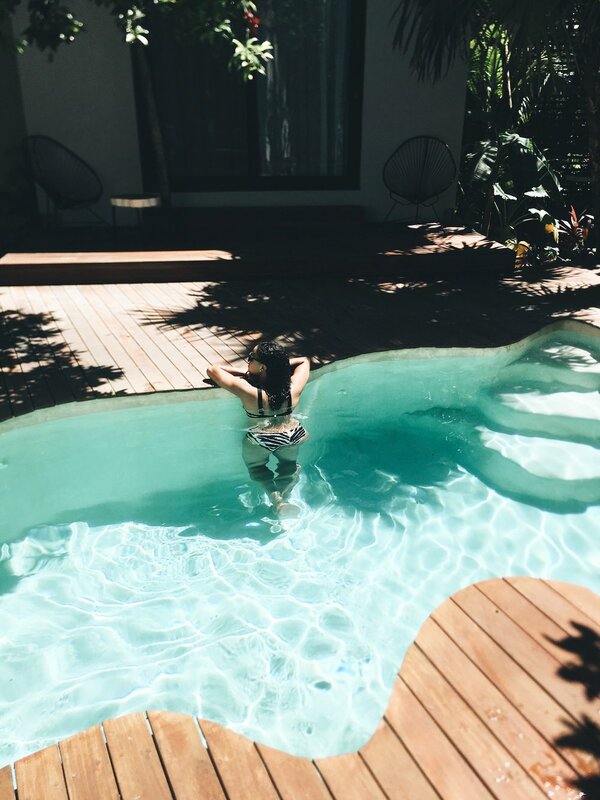 Loved cooling off in our private pool at the Sanara. Even the streets of Tulum are picturesque. A hidden gem in downtown Tulum that served really good pizza. We went all in for pasta at Casa Violeta on our last night. My guy I are both summer babies, so we decided early on when we started dating that instead of exchanging gifts we would take an annual summer trip to celebrate. The only caveat is that it has to be somewhere we both haven’t been. For our first one we decided to tackle Tulum. And I’m still basking in this magical place. The beach, food, jungle - everything was picture perfect. What ended up being the ultimate highlight of my trip was being completely disconnected from everyone and everything. Of course I didn't go into the trip planning to do so, but a mishap in losing my phone (which I was SO lucky to get back!) ended up being the best thing that could have happened to me. I mean, let’s be real, that didn’t come without a slight panic attack at first. But it didn’t take me long to realize what a blessing in disguise it was. To spend numerous days not looking at one email or scrolling through social media simply because I just couldn’t was seriously the most free I've felt in a very long time. Each day my thoughts were only filled with exactly what I was doing in the present moment. That little mishap is now something I will intentionally do every year on our annual summer vaca. Our stay at the Sanara Hotel was amazing! The rooms were beautiful, the onsite restaurant, The Real Coconut, is so good and the staff is incredibly gracious and helpful (they were why I got my phone back). Some of my other favs that we ate at were Posada Margherita, Casa Violeta and Raw Love. Be sure to bring more cash than you usually would. Pretty much all of the restaurants within the main beach drag of Tulum are cash only, which you can easily exhaust on one good night out for dinner + drinks. 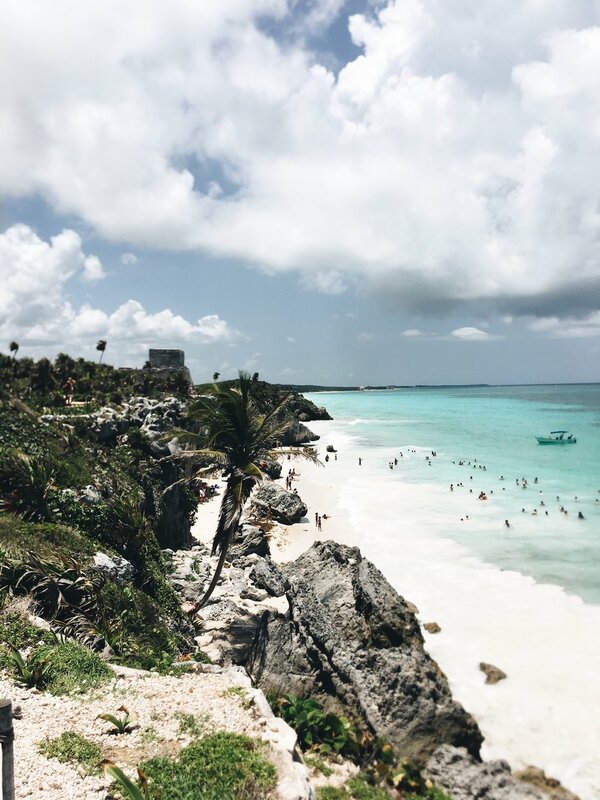 (We did venture into downtown Tulum for a day and noticed most places accepted credit cards and were considerably cheaper than those on the main beach drag). The cabs are also cash only and will attempt to charge you A LOT because they can since they don't run off a meter like we're used to here. We negotiated with drivers and were able to get a better price every time. I definitely recommend exploring the Mayan Ruins and snorkeling at one of the many cenotes. We visited this one and I can’t believe it was my first time ever snorkeling. My favorite way to take this magical place in was on bike so we could stop as much as we wanted to along the way.